I decided to try my hand at making art dolls and have spent months teaching myself (thank you internet!) how to make faces, and hands and feet and eyeballs. My first attempt went ... ok. I am not happy with it. I like the head. I feel like every other part of it was total fail. I will go back and redo the body and turn it into something I can live with and will post her once I am satisfied. In the interim though, I really wanted to create a mermaid. I think my fail-feet and body of the first one led to that desire. And so, that is what this post is about - my very first art doll - hooray! I sort of have a love affair with pretty-ugly things : bats, insects, octopi, those hairless dogs that you see winning the Ugliest Dog Contests all the time to name a few. 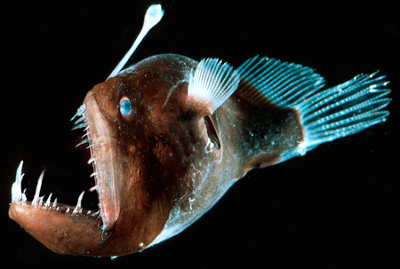 Enter my love for the ugliest fish I have ever seen: the angler fish. Have you ever seen one of these bad-girls? 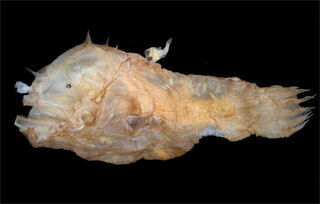 They are super fugs and I think they are on of the coolest fish in the sea. I mean, really, just hideous. They live in the deepest part of the ocean, attract prey into their gaping maws by dangling pretty lights in front of them, and the males basically turn into parasitic sperm donors once they latch on. That little nub in the middle of this one's back is the male. So weird! With all that said, behold! My Angler Fish Mermaid! My first completed art doll. She is about10 inches tall. Polymer clay for the most part, the tailfin is organza sandwiching some angelina film which I then embroidered over. She has mercasite beads for eyes, and beaded necklaces. I made the flowers in her hair from ribbon and glass beads. The hair is Tibetan lambs wool. I am going to enter her into the latest Christie Friesen Swellegent "contest". I was not sure what I was going to do with the tail until I saw that she had announced it and then I was like - well, duh! That's a perfect application. I used the Bronze metal coat, then the Gold-Green Verdigris patina, and finished up with purple and cerulean dye. I might have used black and white too... I think. Loads of detail shots follow. Click to embiggen.